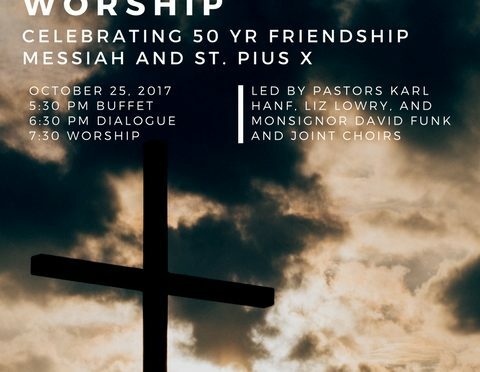 Wednesday, October 25, Monsignor David Funk and Pastors Karl Hanf and Elizabeth Lowry, the choirs of St. Pius X and Messiah Lutheran and each church’s members will gather for a special celebration marking their great friendship that has resulted in meaningful ministry for our community. The event will be held in Messiah’s sanctuary and begin at 6:30. The three pastors will share their experiences working with the other and the hopes they have of growing even closer together in the years ahead. At 7:30 choirs from both congregations will lead a 40 minute prayer service for unity and blessing. Members from both congregations are invited to a buffet served at 5:30 at Messiah.